I know what you're probably thinking, "PEAS? 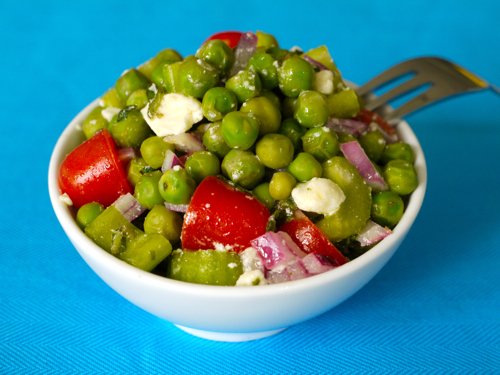 There's no way my kids will eat peas, let alone a salad." Well, I'm going to put forth a challenge to you. I'm willing to wager that if you get your kids involved in making this delicious dish with you, either shelling fresh peas or even defrosting frozen ones and then helping you toss all of the ingredients together, they will be excited about eating it (and their veggies in general). My kids probably aren't that different than yours when it comes to being challenging about what they'll eat (and when they'll eat it). However, time and again I find that by just by letting them have a little independence in the kitchen and allowing them to take part in the cooking process with me -- instead of me just making their meal and putting it in front of them -- makes them have some pride of ownership over the food and embrace eating whatever it is we make together. It may not work on the first try, but don't give up. Eventually it catches on. Now, what will be your grand prize should you choose to accept this challenge? A new car? A free getaway to Brazil? How about kids who want to eat their veggies....and actually think it's cool? That's better than a new car, isn't it? 1. Place the first 3 ingredients in a large bowl and whisk to combine. 2. Add the rest of the ingredients and combine. I just saw an axe commerical...was that you? If so..awesome! Luckily enough for us, the one vegetable our 3 year old daughter will eat without complaint are the peas from our container garden on our balcony. This recipe is perfect timing for us! Can't wait to try it out. I made this delicious salad tonight! I didn't have any feta and just finished up the goat cheese yesterday; I chopped up mini Babybel instead. The salad was easy, fast &amp; fresh tasting. I'm sure it will be even tastier tomorrow, at lunch, after marinating overnight. Thanks for all the wonderful culinary inspirations for the whole family! My 1 1/2 year old daughter LOVES peas. I think she'd like this, the surprise will be if she eats the tomatoes. Absolutely delish! So easy to make. I doubled the recipe for a picnic party and got raving reviews from all! Not to mention my 3 year old and 11 month old gobbled their portions right up! This was so good! Love the crunch of the celery and all the flavors mix so well together. My 16 month old loved it...could not believe a little guy could like feta cheese. Just made the celery well chopped for him. My 3.5 year old is a toughie, but she left the dish on her plate and picked out the peas and tomatoes. Really great dish and awesome for the summer!! This salad is SO good!! Made it for my husband and I tonight, and he loved it! Can't wait till my baby girl gets big enough to try it! YUMMY!! !